Nothing makes us feel better than pleasing our patients. We genuinely love what we do but every once in awhile we are reassured of that passion with a confirmation from our patients. 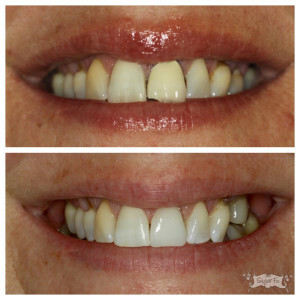 The following case of a front tooth crown replacement is no exception. This week, we present to you a story of hard work and dedication that paid off to create huge smiles for all involved. This week, a very special Sugar Fix patient left her appointment happier than a clam and we all went home to our families happier than we could ever express! This patient had multiple appointments with us in order to ensure her dentistry was done to perfection. She came to us with an older, chipped front tooth crown. This crown had metal underneath it with porcelain fused to the outer portion. (This is commonly seen in older dentistry restorations.) The metal was visible near the gum tissue and cosmetically speaking, is not very desirable, especially for a front tooth. With her patience and Dr. Emery’s hard work, we were able to achieve that perfection we strive for. Her front tooth received an all-porcelain crown that looked and fit perfectly. The porcelain crown was bonded to the patient’s natural tooth for incredible strength and durability. Not only do we want to thank this patient for her time and confidence in us, but also for her sincere happiness that truly made our day. Well, in fact, made our week. Her heartfelt reaction and praise made us all smile from ear to ear and truly warmed our hearts. These moments are so personal, so special, and when they happen, they always confirm to us that we’re working in the right profession! Beautiful results of a front crown replacement performed by Dr. Emery. Sugar Fix deeply understands how important YOUR smile is. Nothing is sweeter. Nothing can give you the feeling a smile or the sound of laughter can. That is what makes this particular case so special. Both the patient and Dr. Emery felt incredible by the end of the last appointment. This is what it’s all about for us & we’d love to help you achieve the smile of your dreams! Gorgeous results! My parents both have this same issue- I think I’ll have them contact you to get this fixed! We all thought they were stuck with seeing the metal!